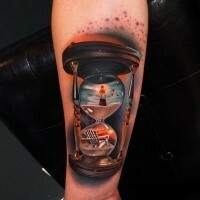 The hourglass by itself is a very old symbol of time. 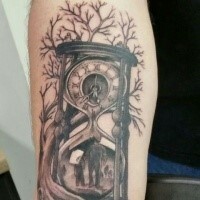 People usually don’t mind about time before it’s too late. 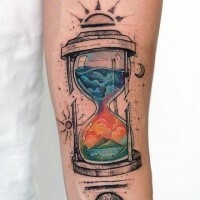 Many of us prefer to have own reminder to stop wasting time in some moments – the perfect one is the hourglass tattoo. 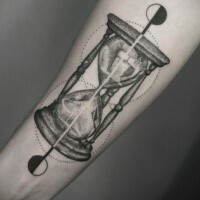 This is the most perfect type of tattoo for people who knows the value of time and want to help people not to waste their own. 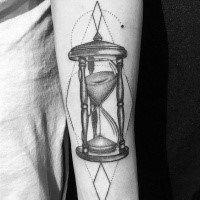 Hourglass firstly appeared before birth of Christ and were used as the most convenient and cheap measure of time for centuries. 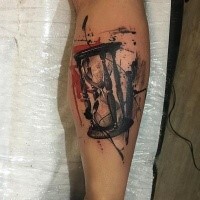 When they become very popular in most countries they deservedly took their place in art. 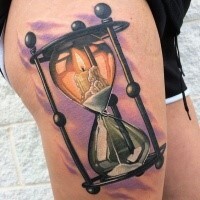 Due to its flexible meaning, hourglass gained popularity in art very quickly. 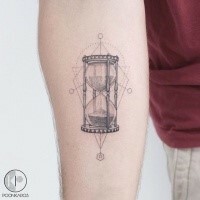 The symbol of hourglass was used in different situations. 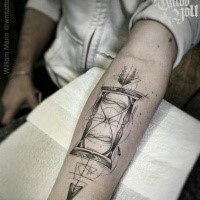 Sea pirates used it on their flags to tell their victims “your time ended”, at the same time artists used it in more positive way – like symbol of life and nature cycles. As for more simple people – they just checked the time of cooking. 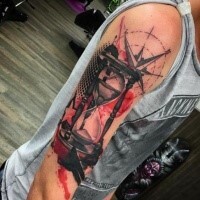 Big hourglass were extremely useful for sailors, as they gave a possibility to measure time in long distance voyages, when sun angles, waves and weather give no chance to know exact time. 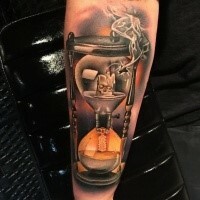 Now the hourglass is used in very limited areas such as: board games, laboratory work, kitchen timer and other small time measurements. 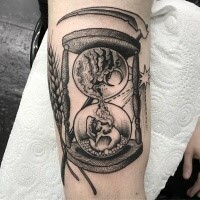 Life and death – the life will go on until sands won’t run off. 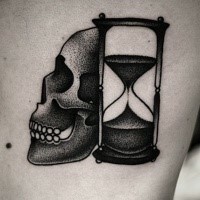 Implacability of destiny – we all are going to face death. Unstoppable power – no one can force the sand to move backwards. 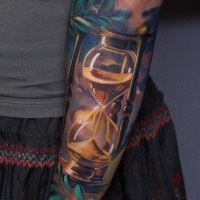 New beginning – the hourglass can be turned and the new cycle will begin. 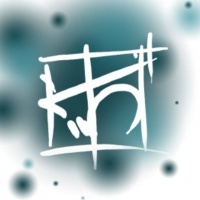 Unstoppable flow of life – everything will pass by, there is nothing permanent in our short life. 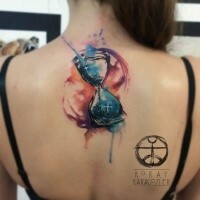 The designs of hourglass tattoo are very different. 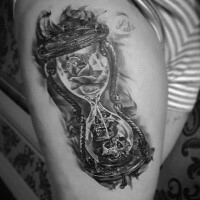 The hourglass can vary in shape and size, can consist of different materials, and have some special symbols and inscriptions. 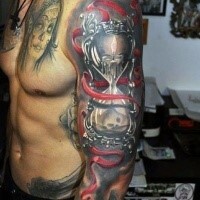 Not only sand is running in hourglass - water, blood, vine and other substances can be found in it as well. 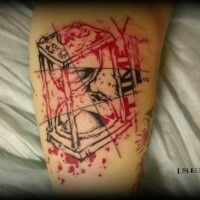 Not rare when hourglass is followed by modern clock or clock inked on the background. 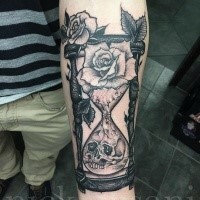 As the hourglass is the symbol of time running out it usually accompanied by similar symbols or some stuff to enhance the meaning of hourglass by itself. 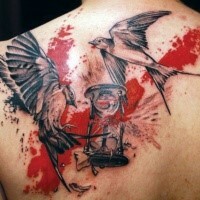 The most popular among them are half burned candles and wings that show us that time is flowing away very fast. 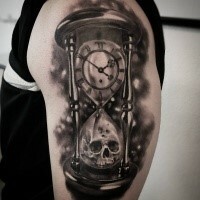 Skulls, crosses, tombstones and other “death” attributes near the hourglass remind us the immovable death. 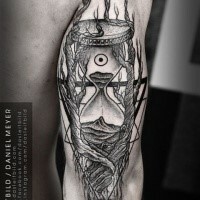 And the Broken hourglass tattoo can depict some suicidal traits of one’s character, as an attempt to stop the time and escape life. 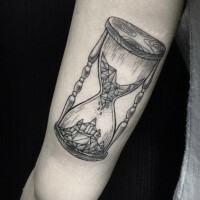 But we need to mind that hourglass represents both life and death so the meaning of its tattoo can vary. For example, some people use it to show that everything has its end, and others can implement an idea of continuous life cycles. 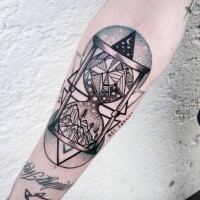 So before getting inked you need to research beloved topic and check out all designs you can find because your tattoo will stay with you for the rest of your life.